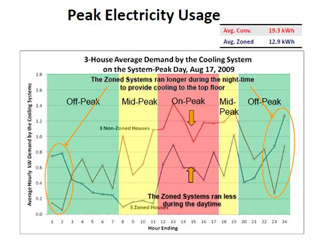 Energy Savings With ZoningZoning Saves - A properly designed zoning system can save on average up to $30 on monthly energy bills. There are several studies that confirm the tremendous energy savings that Zone Damper Systems can achieve over single zone systems. Zoning allows you to shut off rooms not being used and prevents rooms that are already comfortable from receiving air that makes rooms Too Hot or Too Cool. With today’s high cost of energy, and it will continue to go higher, when did you see your utility bill go down just because gas at the pump dropped, everyone is looking for ways to reduce their utility bill. Depending where you live, heating and cooling can be as much as 65% of your monthly utility bill. Heating and cooling unused parts of the home or wasting energy heating or over heating some rooms while others are still too cold is no longer affordable. Many experience this condition in their homes and offices every day. Zoning solves both problems. When you install a zone damper system with a thermostat in every room or zone, you eliminate the problems associated with forced air of rooms that are Too Hot While others are Too Cold. Zoning provides the benefit of Comfort and the value of Energy Savings. These studies show savings of 15% to 29% for zoning over single thermostat homes. Savings will vary a lot by the use of the system. In fact, zoning can actually cost you more, if one were to keep all thermostats set at the same temperature. However the most effective way to save is setting back the thermostats in the unoccupied zones. The amount of temperature setback and time of the setback are all variables on the savings that will be achieved. 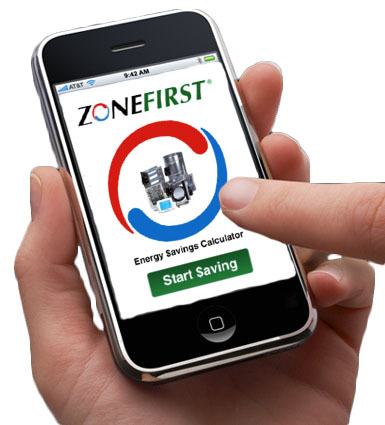 The combination of zoning with automatic setback thermostats will truly enhance your comfort and savings by providing an automatic program for setback for each zone on a daily basis.